The first Chrysler designs from Virgil Exner seem to be the best designs from his tenure, unlike Elwood Engel’s, as he seemed to have a knack for leaving before his designs became obscured by management pressure – or perhaps Engel just had a stronger personality. 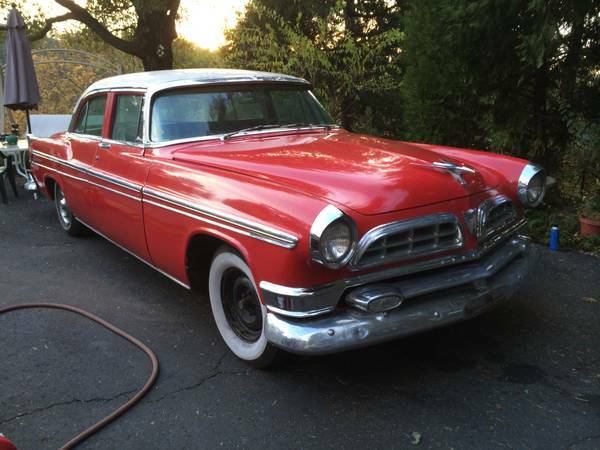 Either way, the 1955 Chrysler sedans were some of the most elegant, continental-looking designs coming from Detroit at the time. And while the coupes and the 300 letter cars have moved out of the realm of affordability, you can still occasionally find a sedan, which has 95% of the styling at 10% of the price. Or something like that. 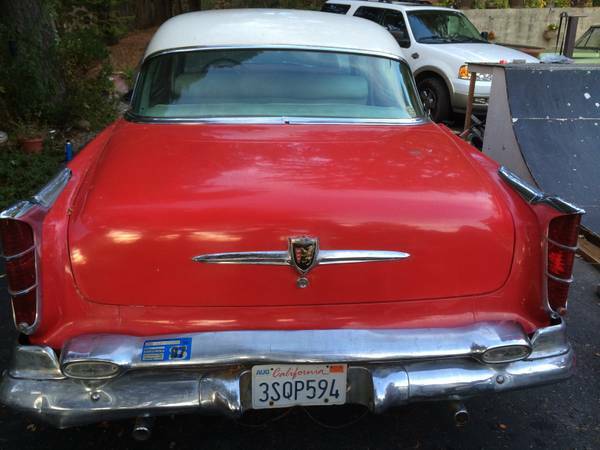 You can find this 1955 Chrysler New Yorker Deluxe sedan for sale for $3800 in Los Gatos, CA. The orangey/salmon-y red really suits the car, and seems to bring out some of its best features. The chrome looks pretty decent, hopefully only needing a good cleaning, and the front hubcap in the picture above is hopefully in the trunk. The paint seems to have decent luster and should work well for a driver, and this car is said to run well. Not many other details are given, other than the need for work on the door panels. Since they are out of the car, it’s not clear what this means – simple installation, refurbishment, or complete replacement. 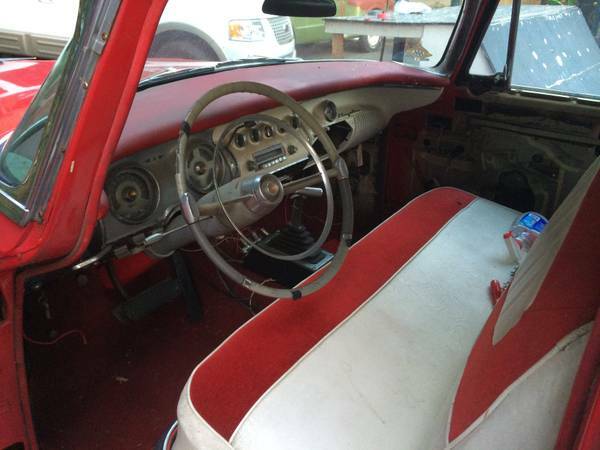 The rest of the interior looks to need a thorough cleaning, but seems otherwise intact and usable. Wait, what’s that on the center tunnel – a shifter? This car would have been originally equipped with a column-shifted transmission, so it would be interesting to know the story behind that. The rear view is great too, with those pedestrian-killing tail lights and the shield in the center. The license plate dates from the mid-1990s, and the 1997 San Francisco parking sticker suggests this was once someone’s daily driver. It would be interesting to know some more about the car’s story, but this looks like a driver project that will outsize and outclass any modern luxury car. This entry was posted on March 14, 2014 at 4:16 pm and is filed under Feature. You can follow any responses to this entry through the RSS 2.0 feed. You can leave a response, or trackback from your own site. Seems like a lot of car for the money. I had the same shifter in a customized 1981 Z/28 I had back in ’94; it was kind of fussy to use but at least it looked like it belonged there. It’s more then a little incongruous here.